Robert Peary stands besides a large chunk of meteorite he salvaged from Greenland. Thousands of years later, this meteorite became the only source of iron for the nomadic hunting tribes that lived on the barren north western coast of Greenland. Devoid of natural metal deposits and with no contact with the outside world, this small community of less than 300 individuals chipped away iron from this enormous space rock and fashioned them into knives, harpoons and other tools. This was nearly 300 years before Norse settlers from Iceland arrived in Greenland and brought iron with them to trade with the Inuit. The British explorer Captain John Ross was one of the first to learn about the existence of this meteorite in 1818. The Eskimos told him of a huge iron rock they used to make their tools, but they wouldn’t tell him where the rock was located. Ross couldn’t find the meteorite but he did collect some of the knives made out of it and returned to Europe. These artifacts became the first scientifically collected pieces of what became known as the Cape York meteorite. For the next seventy years many intrepid explorers tried in vain to located the meteorite until Robert Peary managed to convince a local to guide him to the prized rock. 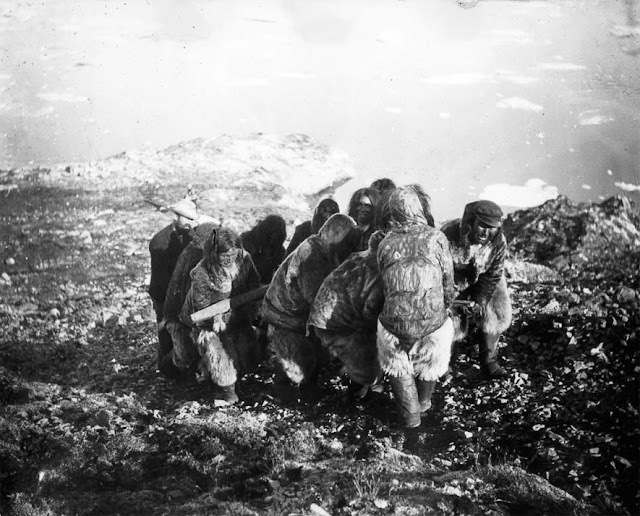 With the help the guide, Peary walked across the snow and ice for eleven days and arrived at two small meteorites, the Inuit called “the Woman” and “the Dog”, and another large piece known as “the Tent”. Each rock was surrounded by piles of “hammer stones” brought over hundreds of years by the Inuit to pound at the meteorite’s surface to extract iron from them. 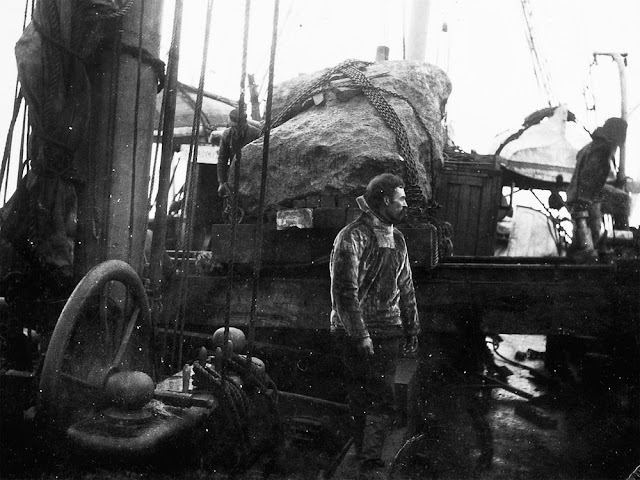 By the time Peary arrived, the rocks had lost its significance as the only source of iron, and Peary managed to coax the Inuit to help him load the meteorites onto his ship. It took him three years to plan and execute their extraction. Peary paid locals with rifles, pots and pans, saws, and knives to heave the meteorite across the island to the boat. The meteorite finally secured on board. 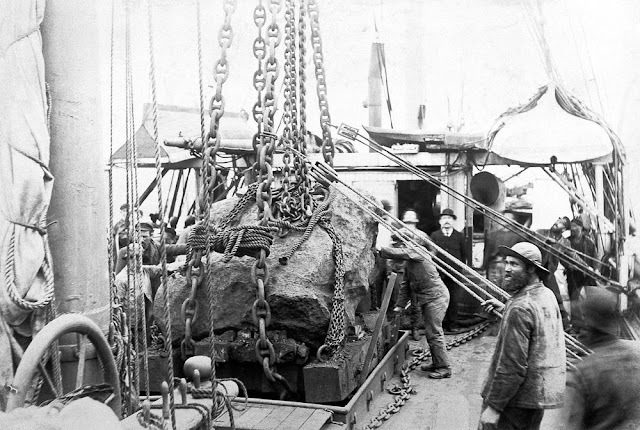 In September 1897, Peary sailed into New York harbor aboard the Hope with the largest piece of the meteorite, “the Tent”, and six Greenland Eskimos. Noted anthropologist Franz Boas of the American Museum of Natural History had asked Peary to bring him one Eskimo so that he could be studied. Peary brought him six, promising them “nice warm homes in the sunshine land, and guns and knives and needles and many other things.” Among them was a young boy, six or seven years old, named Minik and his widowed father Qisuk. The next day, thousand of people swarmed aboard the ship, paying Pearly 25 cents to view the strange cargo. Eventually, the Eskimos were taken to the museum where they were constantly probed and measured by scientists like lifeless specimens. There are photographs in the museum's archives showing Qisuk and Minik standing naked on pedestals. 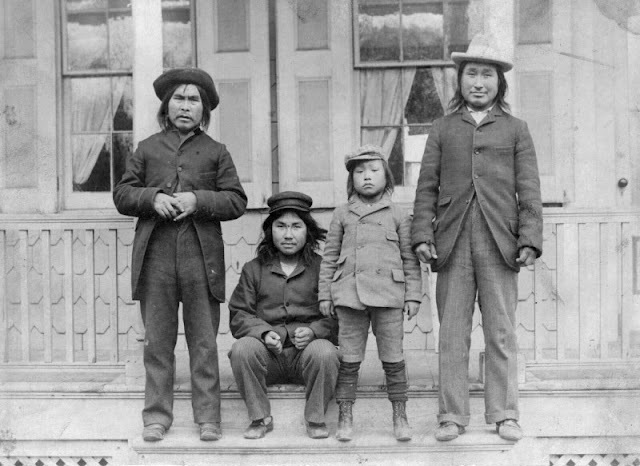 Minik and his fellow Eskimos were kept in the museum's damp and hot basement—conditions unfavorable to people from the cool and dry Arctic air. The idea was to keep them at the museum for a year and then send them back home. Unfortunately, most didn’t even make it to the next spring alive. All of them fell sick to diseases they had no previous exposure to nor immunity. Four died of tuberculosis—among them was Minik’s father. Only one survivor returned to Greenland, leaving Minik alone in the unfamiliar land. Peary distanced himself from the entire affair. In the two volumes he wrote about his Greenland expedition, he never mentioned the Inuit even once. Although Peary made a fortune from his many Arctic expeditions (he sold “the Tent” for $40,000, equivalent to nearly a million dollars in today’s value), he refused to contribute to Minik's upkeep. Abandoned by Peary, Minik was adopted by William Wallace, the museum's building superintendent. Minik attended school and adapted fairly well to his new surroundings and completely forgot his native language and traditions. One day, while at school, Minik learned a terrible secret—the burial of his father that he had witnessed was staged with a log wrapped in furs. The real body had long been striped off its flesh, the bones cleaned and stored in jars in the museum. When Minik discovered the ruse, he began a life-long quest to get his father’s remains returned to him. Minik posses for a photograph with three other Inuit who was brought to New York by Robert Peary. Minik tried his best to adapt to the conditions of his homeland. He even married a local girl, but the marriage failed. Soon he began to miss city life, and in 1916 he returned to the United States. He moved to Pittsburg in New Hampshire and became a lumberjack. And just when he finally seemed to find happiness, the 1918 Spanish flu swept through and Minik died. He was twenty-seven or twenty-eight. 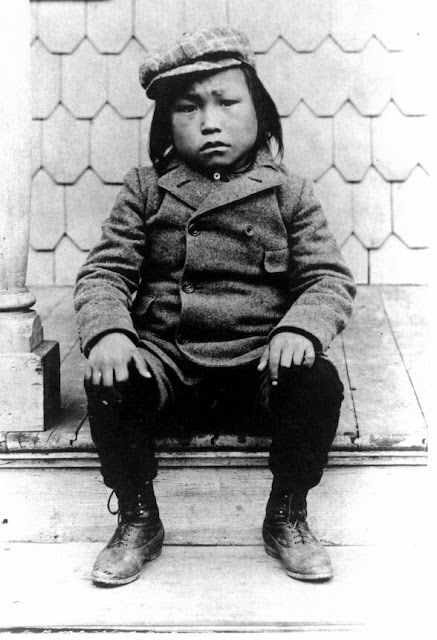 Minik’s story was first brought to light in 1986 through the book ''Give Me My Father's Body,'' by Kenn Harper, an Arctic historian and businessman. Mr. Harper portrays Peary as egotistical and duplicitous, who grew rich selling artifacts to support his expeditions, and passing the sales off as donations. Mr. Harper also accused The Museum of Natural History for being complicit in all of this, in sponsoring and subsidizing the explorers and in pretending to show respect for the cultures and native peoples it studied. Hundreds of aboriginal skeletons, however, are still stored in American museums. Some of these Peary had dug up after they were buried and brought them to America to sell them. 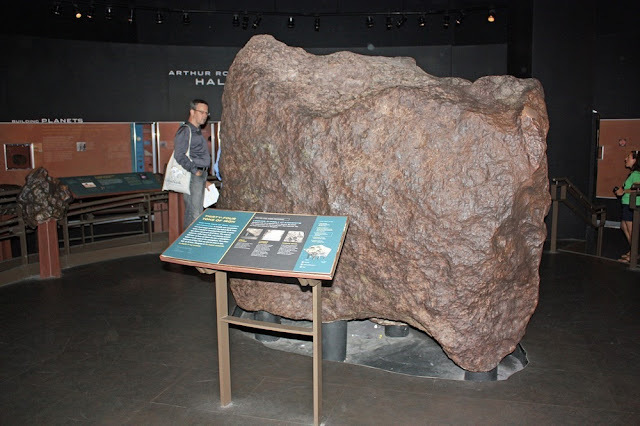 As for the meteorite, the largest piece named “the Tent” or Ahnighito, is still open for viewing at the Museum of Natural History in New York City. At 31 tons, it is so heavy that it was necessary to build its display stand so that the supports reached directly to the bedrock below the museum. Ahnighito, or the Tent at the American Museum of Natural History.